Arriving by cruise ship to an island in the Caribbean can give you an opportunity to capture unique angles of island scenes. 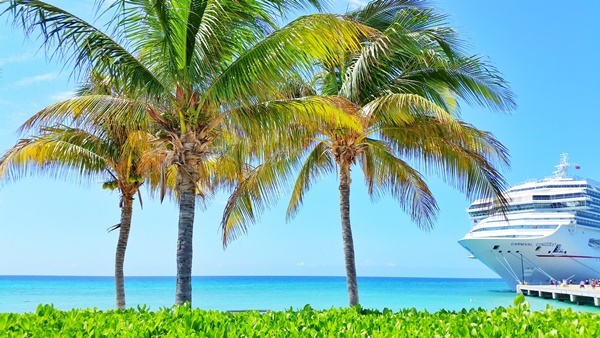 And a cruise to Turks and Caicos can do just that! 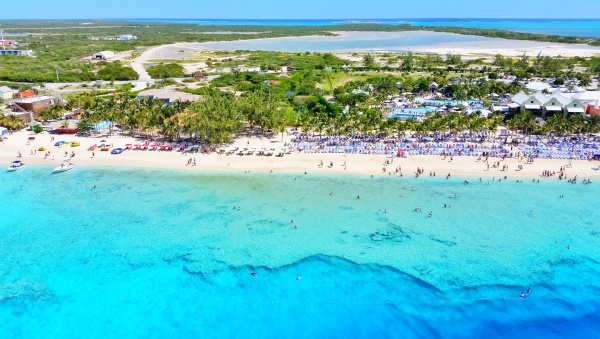 If you’ll be off to Grand Turk and Turks and Caicos during your Caribbean cruise, here are some pictures you just may want to consider taking! These shots are taken either on the cruise ship, or they are taken very close to the cruise ship. So as long as you have an extra hour to spare (or really, even 30 minutes, and maybe even 15 minutes! ), you can take a quick walk around the Grand Turk cruise port to take some pictures after you return from your activities. Or if you’re not going on a shore excursion organized by the cruise line, you can walk around before you head off on your own excursion! The water color is amazing in Turks and Caicos, which means you are sure to get amazing pictures of the ocean no matter where on Grand Turk you go! 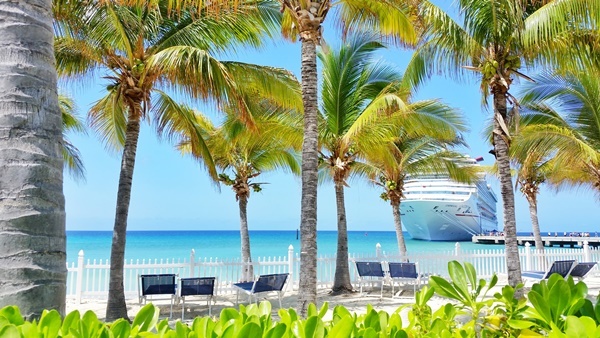 No matter which cruise port you are at during your Caribbean cruise, try to make it a point to walk around the ship on the open deck to see if there are picture-worthy scenes to capture of land. If you can, do a walk in the morning before you leave for your Grand Turk excursion, and then in the afternoon when you get back to the ship too. The way that the sun is shining can make a difference in how your pictures turn out. 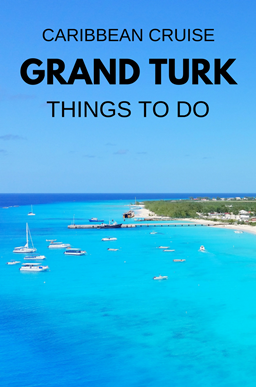 Here are some of the best activities in Grand Turk. 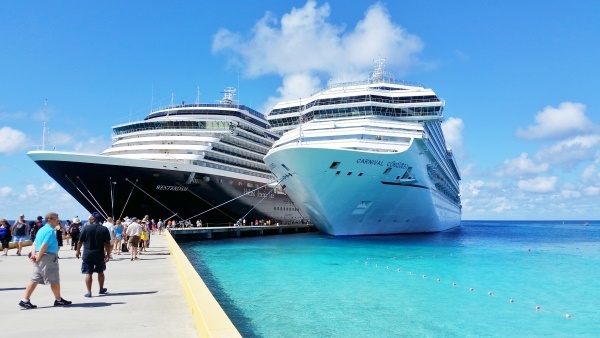 Not all cruise ports have piers set up the way they do at Grand Turk, so it can make for a great picture-worthy shot with a massive cruise ship or two! There is also a big “Grand Turk” sign at the end of the pier that you may want to get a picture in front of too. You can see in the picture above that there are buoys set up in the water. That marks the swimming area of the beach that is right at the cruise port. For a DIY cruise excursion in Grand Turk, bring along a standard snorkeling set like this one or a beginner-friendly full-face snorkeling mask like this one. Then, you can head to that beach right in front of the cruise ship to give snorkeling a go! Or, for more snorkeling spots near the Grand Turk cruise port, here is a map (pdf form) from the Turks and Caicos tourism department. And here are tips for beginners and snorkeling if you don’t know how to swim. So basically, just remember to go in the opposite direction of the main beach to get these pictures. 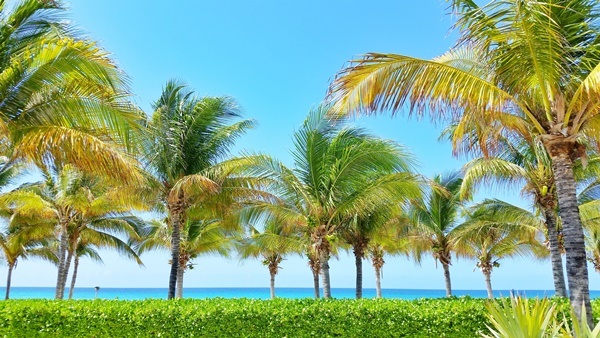 Get some palm trees with and without the ship! Another favorite photo opportunity among some cruisers is right near where this picture was taken. It’s the “Splashdown Grand Turk,” which refers to a splashdown of a U.S. spaceship into waters off of the coast of Grand Turk. This area includes a small outdoor exhibit on the involvement of Turks and Caicos with the United States NASA space program. From the Turks and Caicos tourism department: A little-known fact is that the island of Grand Turk played a part in the 1962 Mercury Space Mission. American astronaut John Glenn’s first step on dry land after returning to Earth was on Grand Turk, and a U.S. Navy Base that was operational on the island at the time, NAVFAC 104, helped in the recovery operations. There’s a memorial to John Glenn and the historic event at the Grand Turk Cruise Center, and the display features a statue, a replica of the Friendship Seven space capsule, and informative plaques. There is another spaceship replica down the road from the cruise port that you may see driving to your shore excursion on another part of the island. Things to maybe pack for your cruise to Grand Turk! Now, here are some things that you just may want to add to your cruise packing list! These tag holders so you don’t end up with lost luggage on the cruise ship! This type of beach bag that’ll help you dry things out so you can be ready for the next beach day! Cruise formal: And here are ideas for your cruise outfits for formal night! 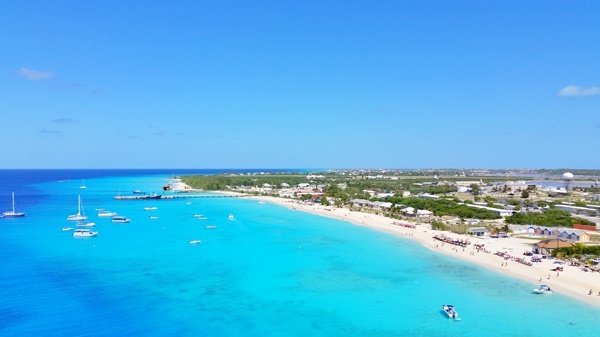 And see if you like any of these top tours in Grand Turk! Pin this page to reference later! – Do you need cruise travel insurance?